Could the Ice Ring be on the edge of the Goldilocks Zone? A question. I do not understand the black center with the glowing center inside that. Is that a photo technique to obtain an image of the ice ring? "O Grammar!" crater ladle gull historically, "Water bag icer gut! A nervous sausage bag ice!" I do not understand the black center with the glowing center inside that. Is that a photo technique to obtain an image of the ice ring? The center of the debris ring, the center of the occulting disk, and the center of the star image do not align. The universe is under no obligation to make sense to me (NDT) , but what could cause it to be off-center? Would the influence of the B and C star, or the planets in the system be enough to shape the debris ring that way? On a different note, is the oval shape of the star itself a result of the imaging system? Oh, I get it. This must be the early, light bombardment. The center of the debris ring, the center of the occulting disk, and the center of the star image do not align. The universe is under no obligation to make sense to me (NDT) :wink: , but what could cause it to be off-center? The "ring" is eccentric (e = 0.12). So the star lies at one focus of an ellipse, not the center. On a different note, is the oval shape of the star itself a result of the imaging system? The star is unresolved, so yes, its shape is an artifact. And I presume that the radial stripes in the background image (blue, the one from Hubble) are also an imaging artifact, right? Roberto Molteni wrote: And I presume that the radial stripes in the background image (blue, the one from Hubble) are also an imaging artifact, right? Yes. Scatter from the optical surfaces. And, Chris Peterson, how do we know / determine the REAL elongation of the ellipses (not the observation one caused by the inclination of its orbital plane with respect to our line of sight)? In fact by the offset of the focus (Kepler's Law), or is there an independent way to verify it? (Such as e.g. Doppler effect at the two opposite extremities of the rotating ring). Case wrote: The center of the debris ring, the center of the occulting disk, and the center of the star image do not align. What could cause it to be off-center? Thanks, I get (the stability of) elliptical orbits, but I was wondering how such high eccentricity could come to be. Intuitively, I would expect spinning protoplanetary stuff to get more and more circular in its orbit. Perhaps an equilibrium is reached before things get close to circular? I don't know. That's the sort of question best answered with modeling. But eccentricities can be maintained by resonances, and we might expect such resonances in a multiple star system. Interesting...and great image... and since our own system has elliptical orbits...why not expect them elsewhere? Their version of an Ort Cloud or Asteroid belt? 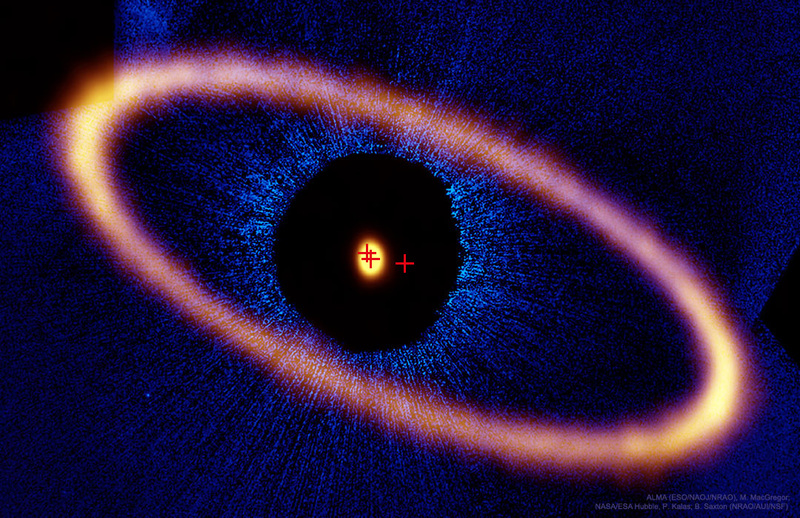 A Saturn like Ice Ring of Comets? T'would seem to be a lot of them. A ring usually implies the ongoing collisions of a "shooting gallery." Such chaos tends to be inconsistent with a well defined elliptical orbit.